BUTUAN CITY, March 25 (PIA) – In celebration of the World Water Day (WWD), employees from different government and private sectors and volunteers have participated this year’s celebration through a clean-up drive and beautification of the Ambangan Creek at Barangay Libertad, here facilitated by the Environmental Management Bureau (EMB) with the Department of Environment and Natural Resources (DENR) Caraga region. Prior to the clean-up activity, the EMB Caraga with DENR Caraga led the Memorandum of Agreement (MOA) signing of the Multi-Stakeholders Adoption of Ambangan Creek held at FSUU Morelos Campus gym. In addition to the existing partnership of EMB Caraga with Equiparco under the Adopt-an-Estero/Water Body Program (AEWBP), five stakeholders , namely Phil. National Police- Regional Police Office, Father Saturnino Urios University, Libertad National High School, Brgy. Libertad and Brgy. Ambago, committed to improve the situation of Ambangan Creek. According to Engr. Renato C. Tacubao, chief of the Environmental Monitoring Enforcement Division of EMB Caraga, 51 water bodies (73 kms.) all over the region are being adopted for the clean-up and improvement activity. The stakeholders are committed to maintain the cleanliness and improvement of the water bodies. The five stakeholders will not only clean the creek but monitor the activities, maintain its cleanliness and improve the present situation, said Tacubao. 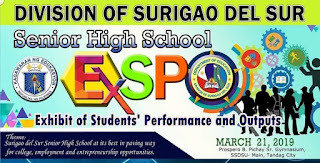 TANDAG CITY, Surigao del Sur, March 25 (PIA) – The Department of Education, Surigao del Sur Division held its 1st Senior High School ExSPO - "Exhibit of Students’ Performance and Outputs" held at the Prospero B. Pichay Sr. Gymnasium Surigao del Sur State University-Main Campus on Friday, March 21, 2019 with the theme of "Surigao del Sur Senior High School at its best in paving way for college, employment and entrepreneurship opportunities." All 88 DepEd Schools and 14 Non-DepEd Schools under the said division that offered two tracks in Senior High School – the Academic and the Technical Vocational Livelihood (TVL) participated in, according to Edna Trinidad, Education Program Supervisor (EPS)/Division Senior High School Coordinator. In the Academic track, each learner has the solid plan to proceed to college depending on the strand: Accountancy, Business and Management (ABM) Strand; Humanities and Social Sciences Strand (HUMSS); Science, Technology, Engineering and Mathematics (STEM) Strand; and General Academic Strand. While for TVL, Trinidad said this track is divided into four strands that would cater to those who want to work immediately after Senior High School: Home Economics Strand; Information and Communication Technology Strand; Agri-Fisheries Strand; and Industrial Arts Strand. During the event, the performance and outputs of the Senior High School Students were also showcased in the exhibit. Senior High Students of the Technical Vocational Livelihood (TVL) track under the Home Economics Strand showcase their talents. 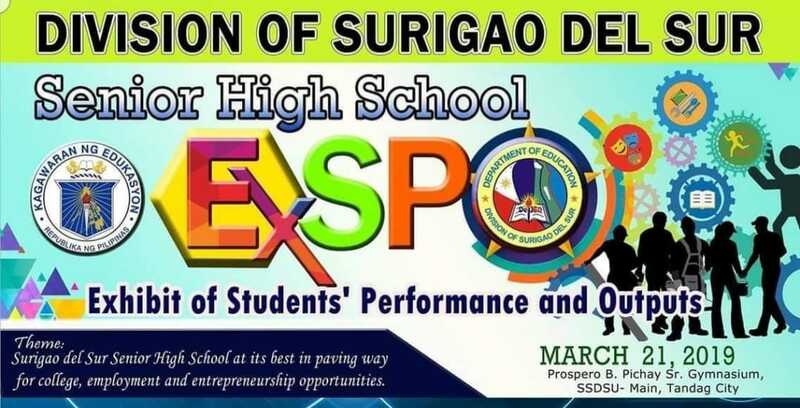 “We are so very happy, so excited, and so overwhelmed of the performance of the Senior High School students,” said Schools Division Superintendent Marilou Dedumo, in her message. SURIGAO CITY, Surigao del Norte, March 25 - Concerned about the progress of the agriculture and fisheries in every community, the Bureau of Fisheries and Aquatic Resources (BFAR) – Caraga promotes the strengthening of Agriculture and Fisheries Council in various municipalities and provinces in the region. Anna Melissa Talavera, officer-in-charge of Regional Fisheries Training and Fisherfolk Coordination Division (RFTFCD), encouraged the fisherfolk representatives and directors to take initiatives, pursue more accomplishments, and to activate all Fisheries and Aquatic Resources Management Council (FARMC) units. This, she relayed, during the election of Caraga regional fisherfolk director (RFD) facilitated by BFAR-Caraga held March 11, 2019 at the Provincial Fisheries Office (PFO) in Surigao City, wherein Robustiano S. Patayon, Jr. of Loreto, province of Dinagat Islands accepted his responsibilities as the new RFD in Caraga. Patayon, the current Municipal Agricultural and Fishery Council (MAFC) chairman in Loreto and a former security guard, expressed his gratitude for being chosen as the RFD. He likewise asked for the support and cooperation of his fellows in the formulation of plans and future activities that they have to undertake. Also, Ruben Timogan from Nasipit, Agusan del Norte will represent Caraga region in the election for national fisherfolk director (NFD) for the year 2019, which will happen on March 21 in Tagaytay City. Timogan is the Municipal Fisheries and Aquatic Resources Management Council (MFARMC) chairman of Nasipit, a deputy fish warden and an entrepreneur. Renito Mindaña was also elected as the regional fisherfolk representative (RFR), while Perfecto Lisondra as RFR Alternate.